My name is Lucille. I am a mantel great dane! I live in a beautiful city, Verona, in northern Italy. In my pack there are also two two-legged animals called Mario and Nicoletta. I let them believe they are the pack leaders… 😉 but I am the leader… no doubt!!! I have two close friends, my neighbours, they are two ponys, Fulmine and Saetta. We keep ourselves company during the day. I will introduce them to you later in one of my posts. I am really happy you decided to visit my site, I truly hope you will enjoy my adventures! Hi there Lucille – you are very beautiful. I have 2 Danes at home, a female Black Beauty called Saxy and a male Mantle called Obi. They don’t have their own blog yet, we are working on that, but I will most definitely visit yours as often as I can, and will send you some messages from my two. Enjoy the love and support that you are going to enjoy in Blogland! Lucille, We must be cousins! I’m a Mantle too and have Italian bloodlines. My human Momma is half Italian. Her family is from the Avellino area. Followed the link in Honey’s blog to come visit you. Welcome to blog world and I hope to read lots more about your adventures and about Italy. Hi Lucille – I came to visit from Honey’s site. Welcome to the doggie bloggy world. I’m a Dane too, a harlequin. I live in the States and spend most of my time goofing off. How old are you? I’m just a teenager. Nice to meet you Lucille! We came over from Honey’s blog! Ciao, Lucille! Welcome to the blogland! Honey told me about you. You’re adorable and I just love your pictures. My Mumma used to have a mantle Great Dane but he went to heaven last October. we are looking forward to reading aboout your adventures! Looking forward to reading your adventures. PS: Welcome to the world of dog blogging! Welcome to the world of dog blogging. We think that your blog is really and really nice and we look forward to reading lots more about you! OH WOW i cant believe how much you look Harley girl. Well i mean how much she looks like you. almost twins! Welcome to the blog world. the two of us are looking onward to reading of your adventures and seeing the pictures of you and your beautiful home. I love your coat!!!! I am a one year old black great dane!! I also have a little white on my chest and white paws!!! I love your pictures! I heard about from my hero Honey the great dane!!! I am excited to hear about your adventures!! Kadie and her mom Jenny! Welcome to Blog world Lucille 😀 You are a VERY pretty girl! Our names are Lexi and Jasper, we are Great Dane puppies that live in New Zealand! We are looking forward to hearing all obout your adventures and training! Honey sent me to meet you and I must say that you are a very beautiful gal. Good luck with your new blog. she send a lot of kisses to her nephew! Like Lucille blog very much. My 2 legged owner and my brother Mack love to follow the lives of fellow doggies all over the world! I’m a little puggle and my brother, Mack, is a Pug. Keep up the blog and we’ll be eager to follow your adventures! Ci manda la bellissima Honey e i suoi meravigliosi genitori….loro sono davvero speciali per noi e quindi come non potevamo visitare il tuo blog????? Noi siamo 3 fratelloni golden retrievers……se ti va vieni a visitare il nostro blog e magari un giorno ci potremo anche incontrare!!!!! Noi visiteremo il tuo sito spessissimo!!!!! Tanti baciotti e dolcissime leccatine!!!!! My good fwiend Honey sent me . It’s a pleasoowe to meet such a gowgeous giwl fwom Italy. Yuou awe so lucky to live in such a bootiful place. My pawents love it, and ev en I was able to go when I was one yeaw old and spend a whole week in Woma. 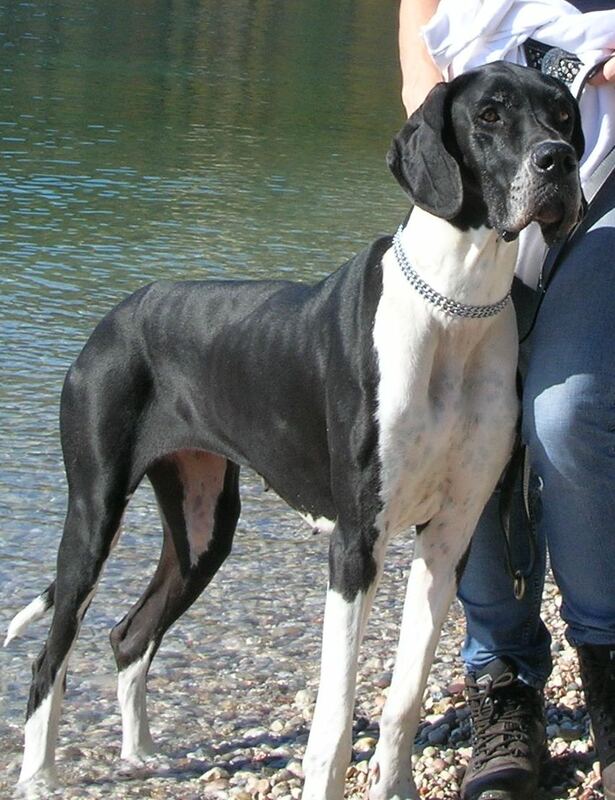 It took me a while to find your blog, finally I thought of Honey the Great Dane, voila, I found you there. Thanks for visiting me, I love your blog, welcome my dear to the blogging world! I’m looking forward to read more of your daily bark. I love your background too, cute paws! Lucille! You’re a beautiful girl! My owner has visited Italy and spoke of its beauty! She also says that a food called spaghetti is very tasty when made in Italy. Your blog looks great! I am going to sign up for your newsletter so I can get the updates. Looking forward to reading future posts. What a cool welcome page! Stopping by on the blog hop, and can’t wait to read some of your posts! Lucille – you are beautiful! I have a dog named Lucy. It’s great to meet you through the blog hop! What a wonderful Great Dane blog! Lucille, you are a gorgeous girl! Merry Xmas to you as well! You are on my Blogroll – its nice to read things about your life in Italy. Thanks for your comment on my blog. Your dog is beautiful! I would love to come to Italy for a wedding, I actually receive employee airfare prices.. so it would be cheap for me to come.. just have to find a wedding.. know anyone? Haha! Could not find your email address – please could you ask your human to send us your mailing address so you can get the little something we have for you ? Woooow, you are a beautiful dog. I like your colors. Wowza! What a big beautiful dog you are! I’m half Italian from Sicily so it is very cool to meet you from the blog hop! We will be back! Loved the ending of your routine for Honey’s dancing competition! It was so loving. I think you both did a great job. Lucille moves so daintily for a Dane. I think all the Danes have really shown what they can do in the world of dancing. Oh Lucille I am so happy to be following another mantle Great Dane. We have been enjoying your adventures for some time now and thought we would say hi. Lot’s of people don’t believe that I am a Great Dane because I am have the same fashion sense as you (mantle). Thanks for sharing your adventures. Hi Lucille Guess what? I look just like you! I think we must be related. I live far away from you in a very cold place called Calgary, Alberta, Canada. Right now it is warm so I like to go outside and run around the garden with my canine brother and sister. Sometimes I get so excited that I accidentally step on them or even sit on them. My human, Cathy, says it’s because I’m still a puppy and when I grow up I will become much calmer and not do those things anymore. That doesn’t sound like much fun so I don’t think I want to grow up! Being 4 months old is really fun! I hope you will visit my website. My human and I are just learning how to do it and Honey The Great Dane and her human Hsin-Yi are giving us some very helpful hints. We are going to make a blog instead. I hope we can become friends. And wow… living in Verona! Like Romeo and Juliet! Will be sure to pass by more often!